2009 was the 30th Anniversary of the Big Trak! The Big Trak was introduced in 1979 for the suggested retail price of $43 USD. That’s equivalent to around $125 in 2009, accounting for inflation. Big Trak toy, circa 1979. A cool-looking plastic exterior with multicolor stickers. Six wheels with the center pair driven by two motors. This allows the Big Trak to drive forward, backward, stop, spin left, or spin right. Photon canon (incandescent bulb with blue plastic filter). Speaker to play various beeps and buzzes. Encoder and magnetic clutch so that driving distances and turn angles are fairly repeatable even as battery voltage drops. Expansion plug port for Big Trak Transport cargo carrier accessory. Beeps every thirty seconds of inactivity to remind you to turn it off to save battery life. Can be user programmed with up to 16 steps. The Big Trak notably lacks obstacle detection, line-following sensors, or any other kind of sensors to allow it to interact with its environment. Also, the lack of a display for showing command steps makes user programming more difficult. Of course, such items would have increased the price, which I imagine was a key constraint for the toy market. After a complete examination of the Big Trak and the Big Trak Transport (trailer), I am in awe of the genius of its creators. From the mechanics, to electronics, to esthetics, to marketing, the Big Trak stands as testament to the talent of the team. I didn’t receive a Big Trak as a child, nor did I suffer from Big Trak envy, so the purpose of this page is to satisfy intellectual curiosity rather than nostalgia. There are a number of sites dedicated to the reverse-engineering, dissection, inspection, and hacking of various modern toys. The answer to what’s inside a Big Trak is a little more elusive, since the product wasn’t in the public spotlight during the age of the Internet. Not only is interest and availability in the Big Trak limited today, but datasheets are virtually non-existent for the obsolete parts contained within. You might find a Big Trak in your parent’s attic (if you were a lucky boy). Otherwise, you can obtain a Big Trak second-hand on an eBay auction. Expect to pay between $40 and $120, plus shipping, depending on quality and accessories. Due to age or abuse, most Big Trak toys now have some form of damage: usually broken axles, front screw hole covers with broken pins, corroded battery contacts, battery leakage into the main compartment, body damage (especially to the corners), peeling stickers, and superficial mottling of the keypad. I was not the first to open up some of the Big Traks that I got. (That’s right, my accommodating wife let me buy more than one.) Missing screws, electrical tape, and yellowing super glue are telltale signs of Dad’s or Junior’s field operation. At one point, there were excellent disassembly instructions at www.robotprojects.com/bigtrak/bigtrak.htm, but that link is now gone. The first Big Trak I received had moderate damage with tenuously effective repairs. Because the damage wasn’t apparent on the outside or before disassembly, I doubt the seller knew anything about it. This means it is possible that you will encounter a similar fate, at no fault of the seller. On the damaged Big Trak, the encoder board had been shattered and partially repaired years ago. This Big Trak also has a broken axle and broken corner (both glued back on) all physically proximate to the encoder board. 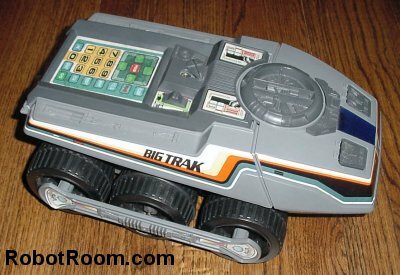 Did this Big Trak get stepped on or dropped? The encoder repair was somewhat impressive since the encoder board is located at the maximum disassembly depth. Most consumers would have given up at that point, and discarded the twisted pile into the garbage. Big Trak infrared emitter and detector board pulled up slightly from the gearbox to show encoder gear with holes. The encoder is simple, consisting of an infrared emitter (LED) and an infrared detector (photodiode) aimed at each other with a gap in between. 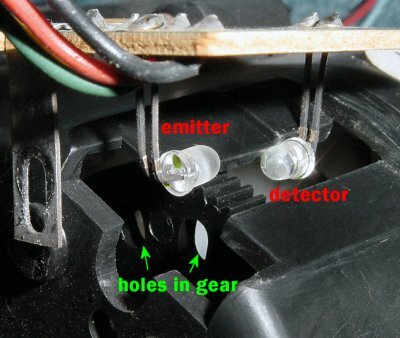 One of the gears in the gearbox has holes in it, so that the infrared light can pass through whenever a hole appears. By placing the gear in the gap between the emitter and detector, the Big Trak sees light on and off as the gear turns. By counting the number of blinks, the Big Trak can tell how far the gear (and therefore the wheel) has turned in order to measure the distance traveled or turned. With a broken encoder, my vehicle never stopped driving or turning since it couldn’t count distance. Yet, an unsuspecting seller would correctly observe that the toy could fire, make sounds, move or turn 'just fine'. The idea that the truck was supposed to stop on its own is not something that would occur to someone at a cursory glance. I ended up replacing the broken pieces of the encoder board with a fresh breadboard and a few wires connected to the original components. It works well now -- almost as good as new. 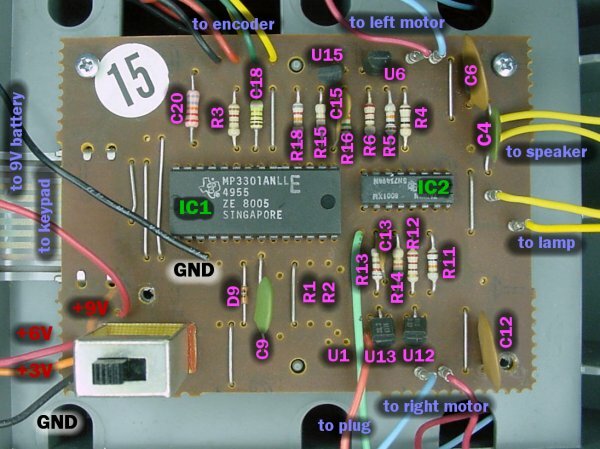 All of the Big Trak electronic components are located on a single motherboard PCB, with the exception of the separate encoder board which is mounted on the gearbox. Various output electronics (expansion plug, speaker, motors, and light bulb) are located at the extremities connected via wires. The light bulb (sorry, photon cannon) and motors were the only connections fortunate enough to be on removable connectors as opposed to soldering the wires directly to the board. It seems financially prudent that connectors would only be included where necessary to make initial assembly easier. Since I plan to assemble and disassemble my Big Trak over and over again, I found it easier to snip all of the wires and add Molex connectors. Main PCB (motherboard) with part number and wiring information from the Big Trak. The motherboard is single layer/single sided. 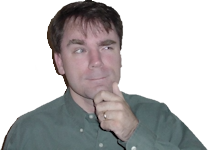 There are between 8 and 10 jumper wires acting as second-side traces on the component side. The PCB does not include a silkscreen (printed layer), so the component numbers are not listed anywhere. As such, the part numbering referred to on the page is mine, arbitrarily based on which IC pin the parts are connected to. Over the years, a number of people have claimed to have reverse engineered the Big Trak schematic. Although slightly time consuming, it isn’t a complex feat. Unfortunately, I haven’t found anyone who’s shared this information publicly, so I am pleased to do so here. Schematic / wiring diagram for the Big Trak. “Newer” (higher serial number) Big Traks use a 32-ohm speaker instead of an 8-ohm speaker. This was an intelligent design change. The speaker is in series with an 18-ohm resistor to reduce power usage. The power source is nominally 6 V.
In such a setup, an 8-ohm speaker receives peak current of 0.23 amps, with peak power of 0.43 watts. A 32-ohm speaker receives peak current of 0.12 amps, with peak power of 0.46 watts. The higher resistance of the 32-ohm speaker reduces the total current, but because it receives a greater share of the voltage relative to the fixed 18-ohm resistor, the total speaker power is nearly unchanged. So, this part change produces approximately the same volume of sound for half the current, thus increasing battery life with no functional loss.